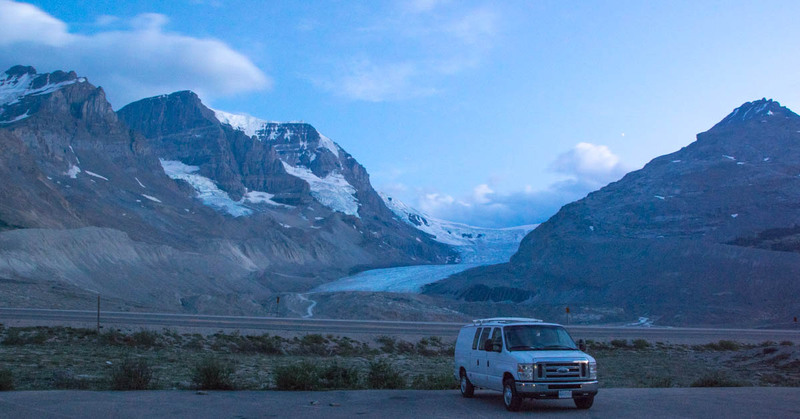 To drive the Icefields Parkway is to be in a state of near constant awe. It’s beyond beautiful and absolutely has to be on your list of things to do in the Canadian Rockies. It’s without a doubt one of the most scenic highways in the world. 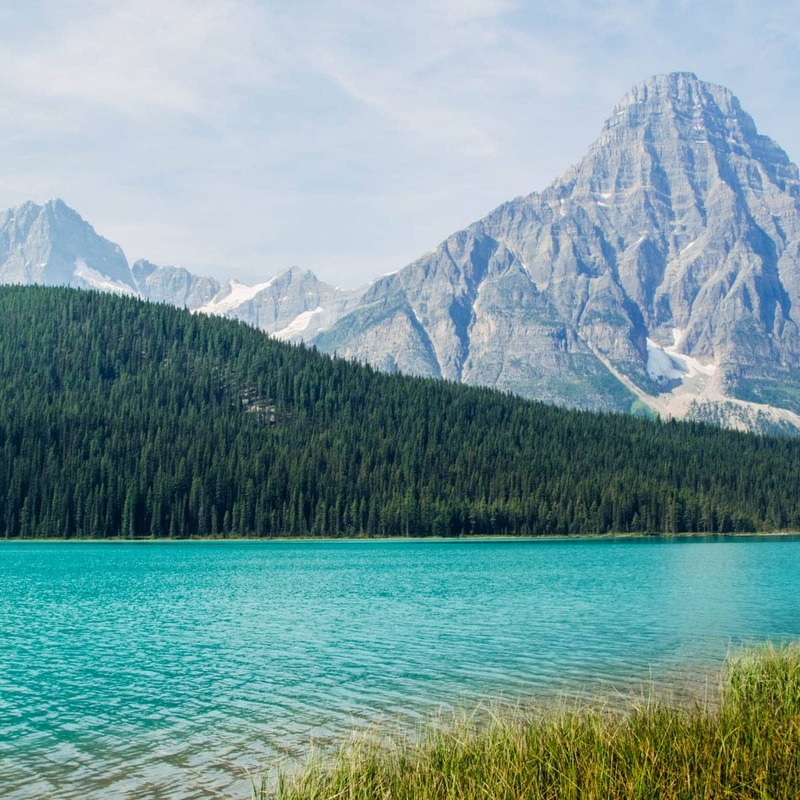 The Icefields Parkway connects Lake Louise in Banff National Park with Jasper in Jasper National Park. The route is 232km long and goes through the heart of the Canadian Rocky Mountain Parks World Heritage Site. Along the way you’ll discover broad sweeping valleys, ancient glaciers, emerald lakes and roadside waterfalls. You may even spot some wildlife too. 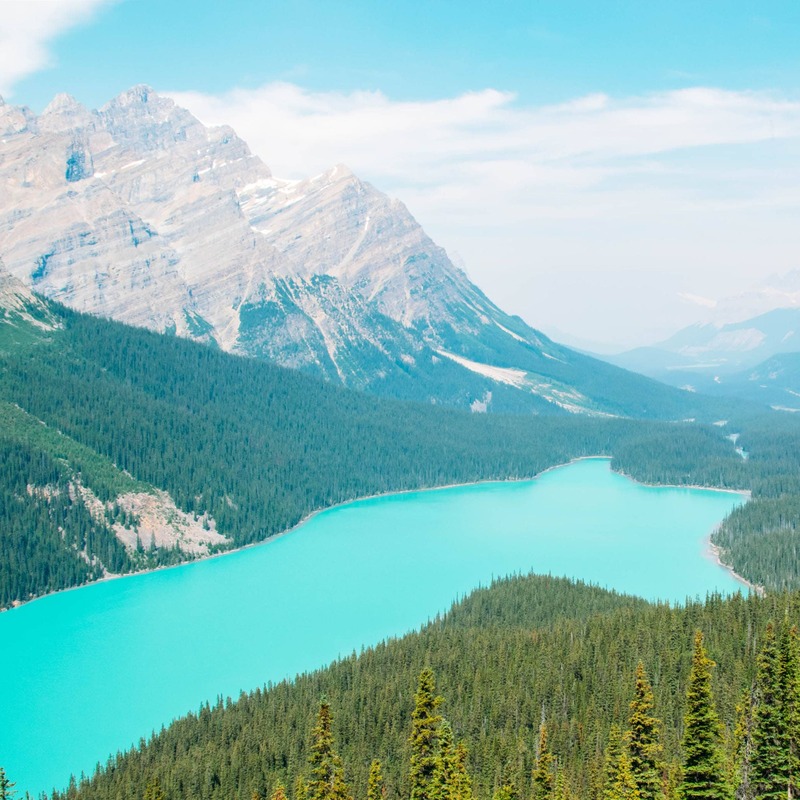 National Geographic have named the Icefields Parkway as “the drive of a lifetime.” You’ll see exactly what they mean as soon as you embark on the journey between Lake Louise and Jasper. 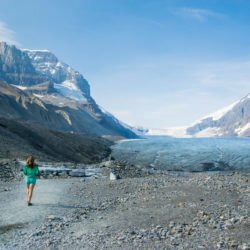 There are plenty of things to do on the Icefields Parkway. I’d highly recommend spending at least two days travelling this stretch of road. 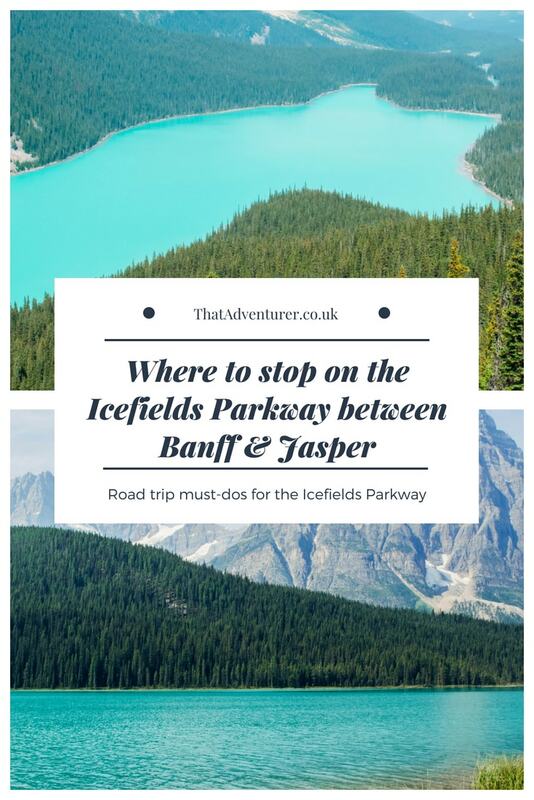 If you’re heading out to Banff and Jasper any time soon then read on to find out where to stop on the Icefields Parkway. Below you can find the map of the the best places to stop on the Icefields Parkway. This list doesn’t include everywhere you could possibly stop. Just a lot of my favourites. You’re bound to see something you think is worth stopping for that isn’t on this list. You can add this list to your Google Maps so that the pointers show when you’re on your Banff and Jasper road trip. 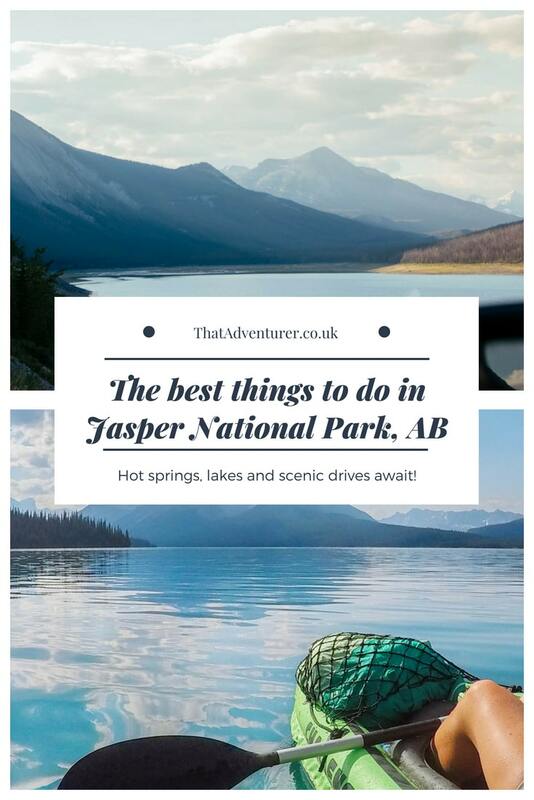 Since Thom and I travelled North to South on our 7 day road trip in Banff, Jasper and Yoho National Parks that’s the way I’m going to write this post. Obviously you can just reverse it if you’re going the other way! 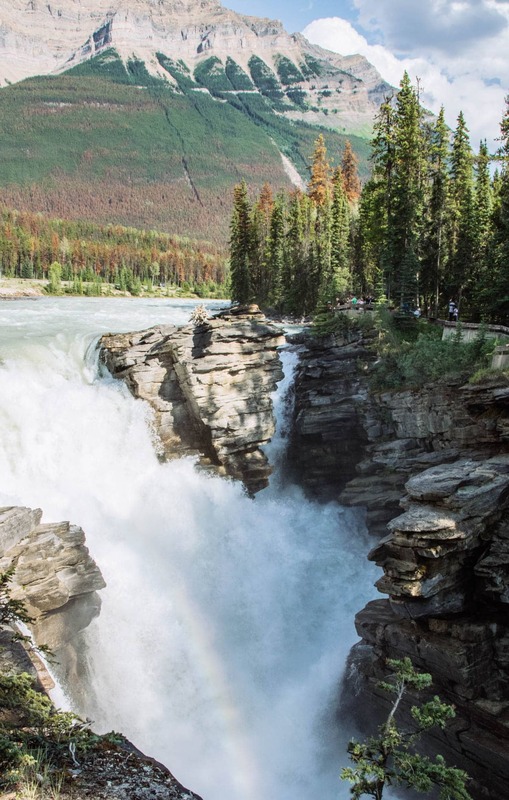 The Athabascs Falls aren’t the highest waterfalls you’ll see on your road trip in Banff, Jasper and Yoho National Parks but they’re still impressive. The ‘impressive-ness’ comes from the power of the water thanks to the size of the river. The water tumbles over a hard layer of quartzite rock and cuts into the limestone beneath. Over the years this has created a series of features such as potholes and a short canyon. It’s the Athabasca River which flows over the fall (you could’ve guessed form the name, right?!) and it’s the largest river system in Jasper. Please don’t be an idiot and try and climb over the railings for a better photo. The rocks are slippery and if you fall you’re going to die. 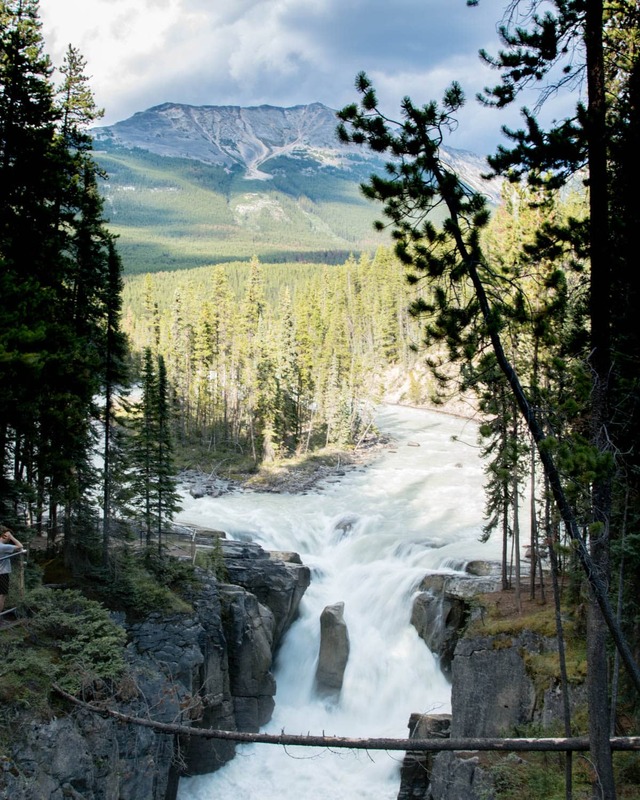 Not much further along the Icefields Parkway is your next stop: Sunwapta Falls. Slightly less powerful than the Athabasca Falls perhaps, but still worth stopping for. 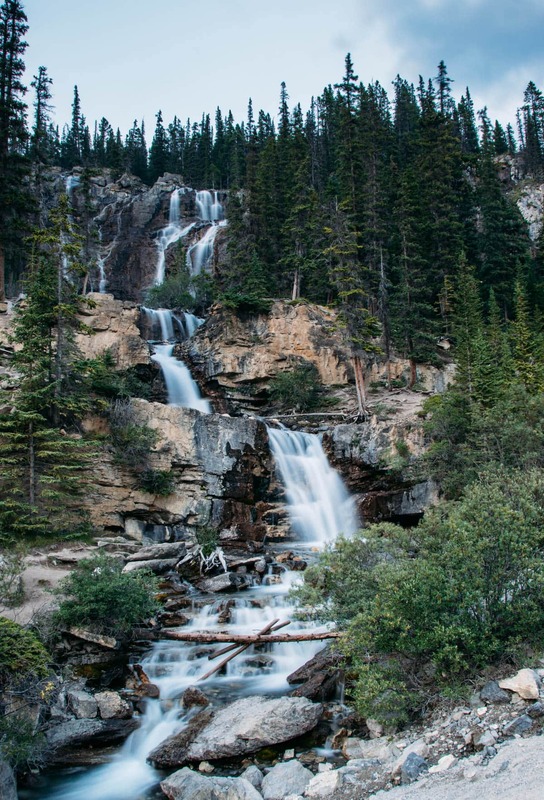 This waterfall is one of many waterfalls in Jasper that was created by hanging valleys. Hanging valleys are U-shaped valleys formed when glacier ice receded 8000 years ago. Larger valleys were carved deeper than smaller ones and in places where the two meet, the smaller valleys “hang” at a higher elevation. This creates perfect conditions for waterfalls. 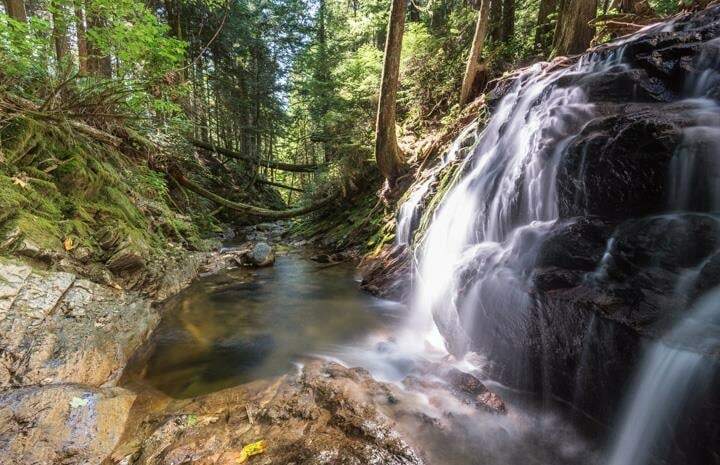 At Sunwapta Falls, the smaller “hanging” Chaba Valley and larger Athabasca Valley join in a spectacular stepping waterfall that has carved a deep limestone gorge out of the rock some metres below the footbridge. I hadn’t seen this mentioned anywhere before we drove down the Icefields Parkway. But this little roadside waterfalls was one of our favourites. We were driving at dusk to the Columbia Icefield Centre where we’d be camping for the night and spotted this creek to our left. There was no one else there and so we immediately parked up and got out for a better view. 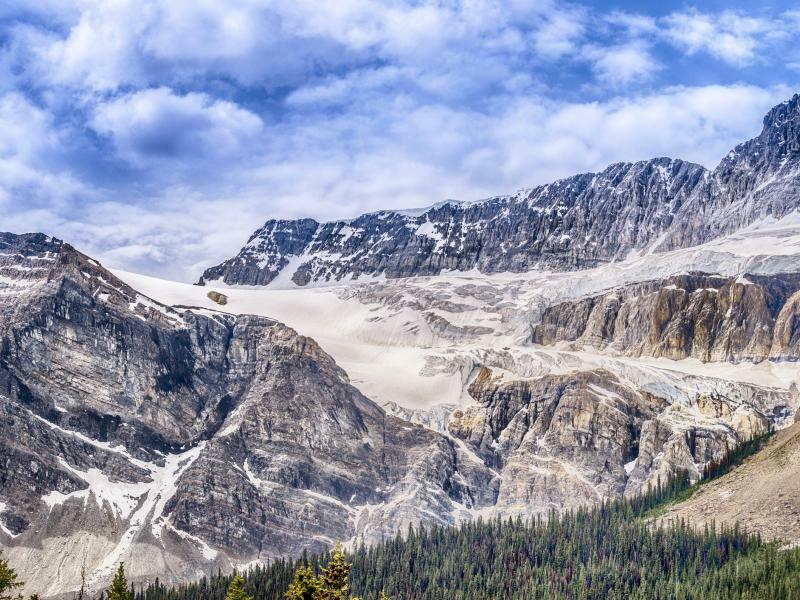 This is one of the most popular stops on the Icefield Parkway and for good reason. 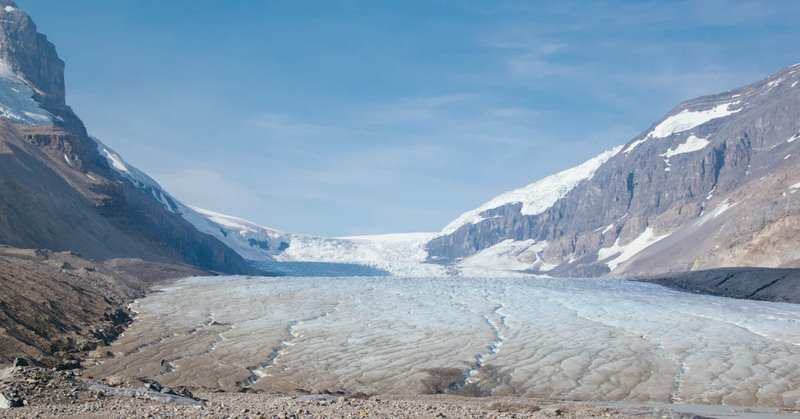 The Columbia Icefield is the largest icefield in the Canadian Rockies and the Athabasca Glacier is the most visited glacier in the whole of North America. The glacier is continuously moving and when you hike up to the toe of the glacier you’ll see signs along the way informing you of where the glacier was a few years before. It’s lost half of its volume in the last 125 years and has retreated more than 1.5kms! You’ll know when you’ve go to Big Bend without having to check your GPS. The road descends into the valley while clinging to the wall of a mountain, surrounded by towering peaks. You’ll get incredible views of the valley and river at the bottom. We didn’t realise the name of the lake when we stopped here. We just wanted to stop to take in the beauty of the lake! I’d highly recommend you do the same. It’s a gorgeous colour and the mountain in the background just makes it all the more photogenic. There are a few hikes you can do from the campground near the lake too. This is the lake you will have seen all over instagram and in tourism brochures. Not only is it a fantastic colour but it has a unique shape too that looks a bit like a dog or wolf. The lake is just a short uphill hike from the carpark on a paved trail so it’s pretty easy to get to. It’s busy, sure but you’ll still get a great view of the lake. Bow Lake is another fairly small lake near to Lake Louise. Here you’ll get views of the Wapta Icefield, Bow Glacier, Bow Peak, Mount Thompson, Crowfoot Glacier and Crowfoot Mountain. In the summer months the water goes a gorgeous milky, turquoise colour! Just before you arrive in Lake Louise there’s (at least) one more stop on the Icefields Parkway worth making. Pullover and take in the view of Crowfoot Glacier which is nestled in Crowfoot Mountain above Bow Lake. The glacier was named as it used to have three claw-like toes but nowadays you’ll only really see two since the lowest one melted in the 1940s. 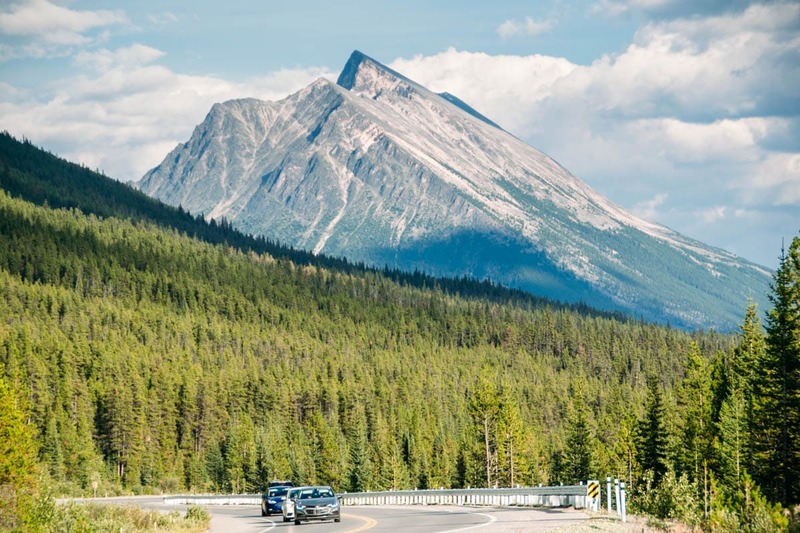 Before you embark on your road trip on the Icefields Parkway, there are a few things you should know to make your journey all the more enjoyable! There is pretty much no mobile signal on the Icefields Parkway. You can get some free wifi at the Icefields Centre if you’re absolutely desperate. But honestly, you’ll probably enjoy being “off-grid” for a day or two. There is just one place to fuel your car: The Crossing Gas Station in Saskatchewan River Crossing. It’s best to fill up at Lake Louise or in Jasper (depending on which direction you’re travelling). From October to May there is no road maintenance from 3.30pm to 7am. Expect snow in winter and perhaps closures due to avalanche control. Make sure you have winter tires from October to May. Check road reports (511 Alberta) before driving. If you stop to see wildlife pull well onto the shoulder and stay inside your car. If you’re going out hiking, be sure to have bear spray on you. NEVER try and feed wildlife or get out of your car! 232km may not seem that far but doing it in one day means you’ll end up rushing some sections and you’re not going to want to do that! I’d suggest at least 2 days. This way you can stop whenever you want, for as long as you want. Check out RentalCars for great rental deals. There aren’t any supermarkets or many places at all to buy food. You’ll only find some snacks. Make sure you stock up in Banff or Jasper (even Lake Louise doesn’t have that much). 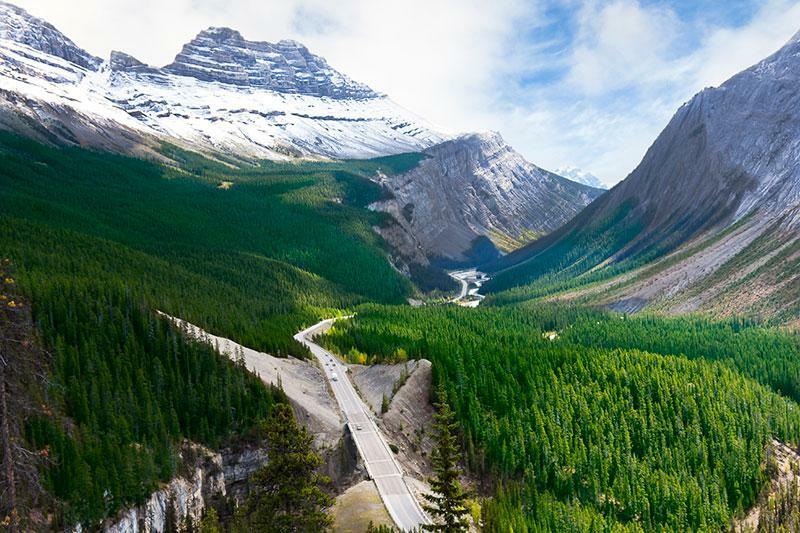 The Icefields Parkway stretches between Banff and Jasper National Parks. You are required to have paid an admission fee to the parks. A pass can be bought online, in MEC stores or from visitor centres and park gates. Make sure you display the pass or the receipt on your dashboard at all times. Campgrounds are mostly self-registration along the Icefields Parkway. This requires putting cash in an envelope although at some you can also write down your card details before slotting them in a safe box. Cash seems a bit safer though. Most campsites for a small van/camper are a max. of $15.70 a night so plan accordingly. There are a lot of places to stay along the Icefields Parkway but most of them are campgrounds. That’s partly why I recommend hiring a camper van (or taking your own), or camping when you visit Banff and Jasper National Parks. It does make accommodation a lot easier! All the campgrounds on the Icefields Parkway work on a first come, first served basis. You can check in from 2pm and check out is 11am. Get there a bit before 2pm just to make sure you’ve secured a space and then spend the rest of the afternoon exploring. Most of these campsites just have pit toilets and no showers – but it’s only for a night or two while you travel the Icefields Parkway! If you want some tips on how we stayed clean in our van for 5 months then check out this post. Campgrounds are around $15-20 per night and you’ll need to pay cash. You can leave your card details on a slip of paper in the honesty box but cash is easier and (I think) safer. There are also few hostels and hotels along the Icefields Parkway. You’ll need to book these quite far in advance as there aren’t that many options along this road and there is a lot of demand. , for those who prefer a bit more luxury. Num Ti Jah Lodgeand Sunwapta Falls Resort would be my two recommendations. 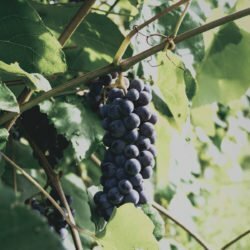 Make sure to book fast as the demand is a lot bigger than supply. Sunwapta Falls Rocky Mountain Lodge: 53km south of Jasper, 178km from Lake Louise with a restaurant and bar. HI Rampart Creek Hostel: 142km south of Jasper and 90km from Lake Louise. Dormitory style rooms with shared bathroom, bedlinen included. The Crossing: 153km from Jasper and 79km north of Lake Louise has a pub, fitness centre and sauna. Probably the most luxurious place along the Icefields Parkway. Num-Ti-Jah Logde: 39km north of Lake Louise and next to Bow Lake this lodge has a restaurant and rustic interiors. HI Mosquito Creek Hostel: 206km from Jasper and 26km from Lake Louise. 20 minutes’ drive from Lake Louise, hostel offers shared kitchen facilities and a wood heated sauna. GasBuddy – great for finding the cheapest gas. Fill up in Alberta before heading back into BC as it’s so much cheaper! This is amazing! I would love to do the drive of a life time! Reminds me a bit of the Flam railway in Norway. 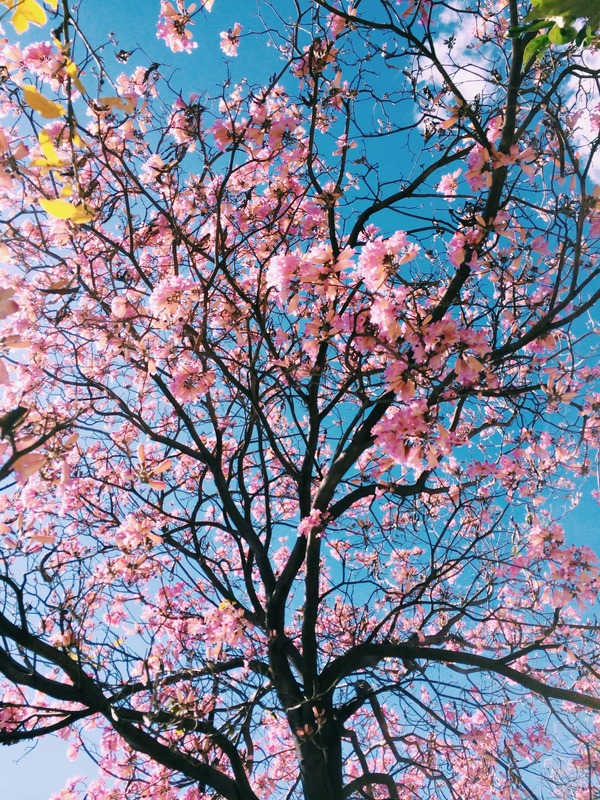 Thanks for sharing your beautiful photos!!! It’s such a beautiful drive! Oh I haven’t been to that part of Norway! Omg Icefields Parkway is so beautiful! I want to go so badly!